A few days ago my neighbor told me he was going to Europe and asked me if I’d take a bunch of avocados and freshly picked peaches. DUH. So I thanked him kindly and told him, though, living next to a musician isn’t ideal, I’m so grateful he’s a good pianist and not a bad one. He was happy. But have you ever lived next to a bad musician? Nothing adorable about that. Nothing. I started with ripe avocados that were firm. I dunked them in flour, egg and then panko bread crumbs. Now, I know the entire world hates frying, but these don’t require a deep-fry. Just take a skillet and pour enough oil until 1-inch of it reaches the sides. Think of it like a casual chill fry. It wasn’t much effort at all. I charred some tortillas, cut up some radishes and crumbled some cotija I had leftover from the Eloté Soup. I like most of the recipes on this site, obvi, but these tacos might be one of my new favorites. 1. In a medium skillet, add enough oil until it reaches about an inch up the sides. Heat the oil until it reads 375 degrees F on a deep-fry thermometer. Line a baking sheet with a bed of paper towels and set aside. 2. 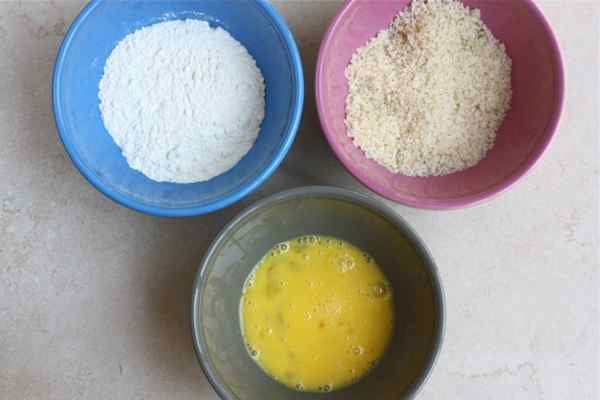 While the oil is heating up, place the flour, egg and panko in separate bowls. Add the salt to the panko and mix. Dip the avocado slices in the flour, shaking off any excess. Transfer them to the egg, then the panko and coat thoroughly. Repeat process until you’ve coated all of the avocado slices. 3. Gently place the avocado slices in the hot oil, being sure not overcrowd the skillet, and fry until golden brown, about 30 to 60 seconds on each side. Transfer them to the bed of paper towels. 4. 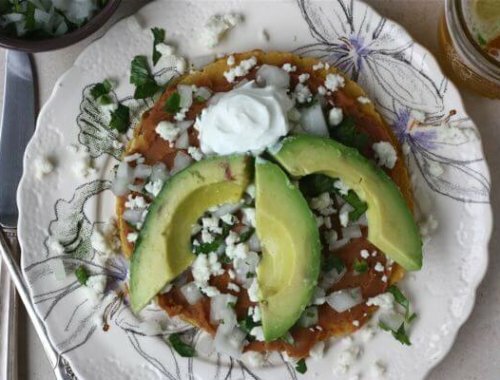 To assemble tacos, place a few pieces of fried avocado in the center of a tortilla. Top with cotija cheese, radishes…or cilantro, white onion, hot sauce, etc. Do as you please! Just make sure to include a squeeze of fresh lime juice. That’s a must! I’m learning so many things from your blog. 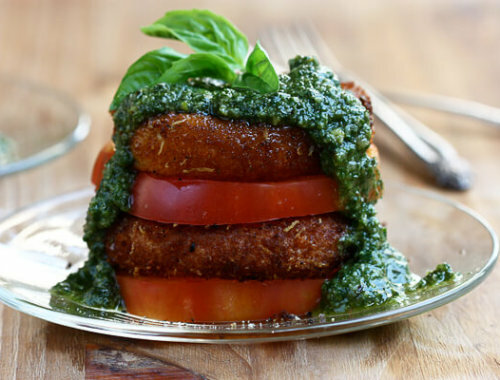 For instance I never had fried avocados in my life…I know, how provincial of me…I’m gonna fill this gap this weekend as I have so ripe avocado that might be just perfect to make this recipe! I want to say something intelligent about this, but I’m too distracted by fried avocado tacos. You are my new hero. That is all. You made me hungry with that tweeted avocado photo last night. Aaah but it was worth it. These look delish. Maybe I will need to do some light casual chilled laid-back frying when I next get a haul of avocados. Pity I don’t live next door to some dude that has an excess crop of them! That might possibly the most perfect meal ever. Ever ever. my boyfriend HATES avocados! but hey, all the more for me i guess 🙂 p.s. your giddiness is so contagious! Said it on Instagram & I’ll say it again here, you.are.my.hero! I love you. And your tacos. That is all! There is nothing that I don’t like about this concept. You are a genius. 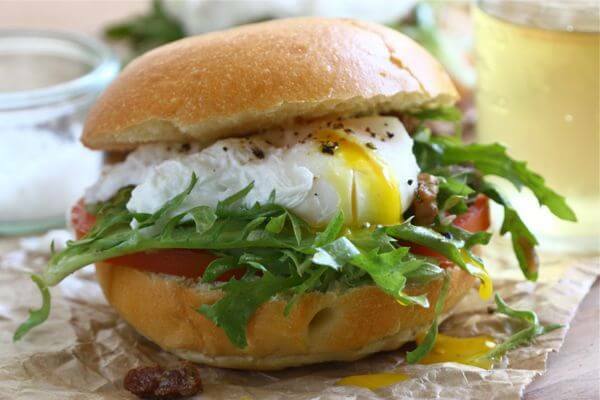 You just made avocado even more amazing! ok, oh my gosh. I have no words for this awesomeness. I may have to try these.. I love all your breaded chill fry recipes, but i seem like I always end up with more egg and panko on my fingers than the food…? especially with the coconut shrimp. I made those and my index and thumb were covered in flour and coconut. maybe I should dip with a fork? tips? Ahhh yes, actually I don’t have any pro tips. I usually keep one hand free and the other hand is a mess. Just the perils of getting messy in the kitchen I suppose. There’s nothing I quite like more in this world than a perfectly ripe avocado! I used to live next door to an entire BAND. Not just one musician, the whole kit and kaboodle, including guitar(s), bass, and yes, a DRUM SET. Did I mention they were all pot heads? Yeah. Anyways, these tacos look amaz. I’m not usually one for deep frying–but I may have to make an exception for these avocados! The tacos sound seriously amazing. My sister and father-in-law hate avocados . . . they are nuts! I tell them how sad it makes me every time the topic arises. Holy crap. 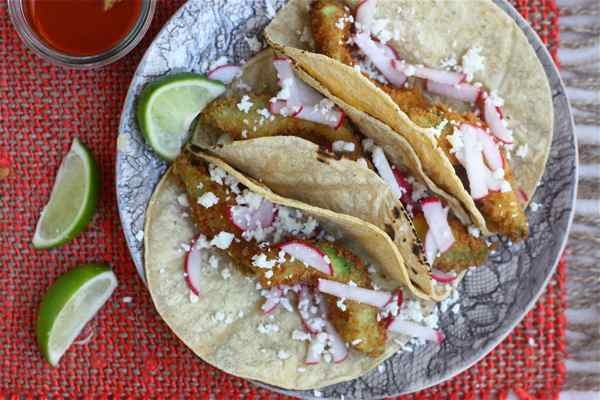 Fried avocado tacos? This is sheer genius, I have to make these!!! Wow-I love, love love avocados. Could these be a finger food appetizer? What would you suggest as a dipping sauce? These sound like a vegetarian taco I’d actually get stoked on eating. SMART. Funny, I did try to look particularly cute today and I AM wearing new jeans! I am making carnitas this weekend from your recipe. It’s sooo good! Maybe I will add some fried avocado to mix it up. I first tried deep fried avocado fries at On the Border and fell in love. This recipe sounds awesome!!! My Dad’s boss makes a great dipping sauce that he recently served with avocado fries. It would be great drizzled on these sinful tacos…a little mayo, some fresh lemon juice and some juice from a jar of HOT peppercini’s. Sorry no measurements given – I just took a scoop (1/4 cup?) of mayo and added the other two juices to taste and drizzle-able consistency. It’s also a great dipping sauce for steamed artichokes. I officially need to head off to lunch, since you have me drooling! OMG. OMG…I mean wow. I want to be your neighbor right now. I swear I won’t play music at all if I could have one of these!! Man I wish I was at home right now instead of being stuck at work, so that I could be making these asap! They look amazing! You da man. This sounds incredible! You make frying things so appealing and simple-like. I want to fry with you! HAHAH. “I want to fry with you.” Best line ever. What an amazing idea!! Must go get avocados! I thought fried avocados were so wrong…until I tasted them for the first time. Putting them in tacos is pure genius. These look so interesting and yummy! this is genius. pure and simple. My boyfriend, who will eat pretty much anything, doesn’t like avocados. Personally I can’t fathom the idea of not eating avocados, considering their deliciousness….and ability to take on any flavours depending what you do with them. They’re the perfect food! Holy Lord Almighty, I’m IN. sweet jesus…all I saw was “fried avocado tacos” and I had to write a comment. GENIUS. YUM. Fried avocado is one of my favorite ‘guilty’ pleasures. Looks awesome! It must be a habit acquired from watching my mom, but I only buy 1 or 2 avocados at a time.. just looking at the photo with so many waiting to be eaten has changed that for me forever!! Excellent that you’ve deep-fried them.. crunchy then soft inside!! i had fried avocados once and they were life changing!!! Come over and check out the Fro Yo Pie I put together. 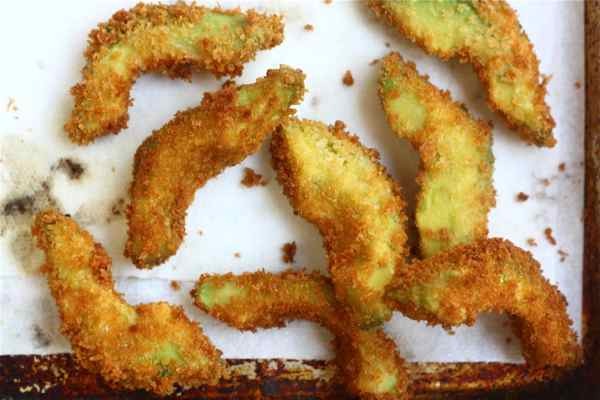 Never heard of fried avocados…but avocados are a staple in our home and this is a must try! Thanks for sharing! I do love avocado, but I just can’t bear to eat it warm… I’ve tried deep-fried avocado at the OC Fair and hate when I have to reheat Chipotle leftovers that have guacamole on them. It turns sour tasting! I agree! I don’t care for warm avocado but these are amazing! Melissa: Do you reheat the Chipotle in the microwave? That could make it sour. I am a food blog addict, but rarely comment on them. But had to comment on that fact that you are a genius. Fried avocado. That is food erotica. oh my. oh my. oh my. Made these and LOVE them! Didn’t use egg; just panko and flour/spices. I also used one that was still a bit firm yet ripe enough and it didn’t get mushy or anything. why hadn’t I ever thought of doing this?! I’ve been DYING DYING DYING to try fried avocados. Have you tried them in the oven? I might have to do that.